We at White Diamond Research are medical device experts. Recently, we have been exposing medical device companies that have inferior devices. Over the last eight months, we have published on Seeking Alpha bearish reports on the following medical device companies: T2 Biosystems (TTOO), Apyx Medical (APYX), Helius Medical (HSDT), TransEnterix (TRXC), and Viveve Medical (VIVE). Since publishing our reports, all of these companies lost from 20% to 70% of their value. You can see our 3rd party verified results on these stocks here. In this report, we are adding Conformis (CFMS) to our bearish list. 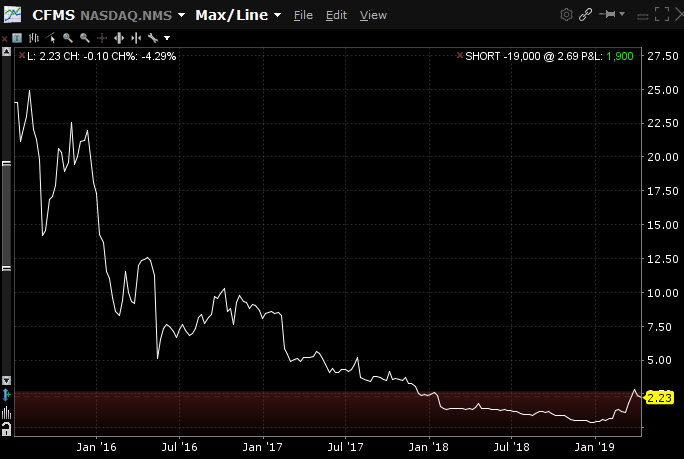 As shown above, CFMS went from trading in the $20s during 2015 after its IPO that year, to as low as $0.358 on 12/31/18. A tale of rapidly crushed hopes and dreams. But wait - look at where the stock is trading today, at $2.20. CFMS was trading below $0.40 on January 2nd and went on a strong uptrend to around $2.20 today. After many hours of due diligence, interviewing experts, listening to conference calls, reading company and sell-side analyst reports, and analyzing financials, we have come to the conclusion that there is absolutely no fundamental reason for this rally. We believe Conformis is still a failure, and the stock will return to $0.50 as soon as investors realize the lack of positive developments and the company runs out of cash again. Expert #1: A physician who does knee implants. Expert #2: An orthopedic sales and marketing professional who had worked for a major knee implant manufacturer for five years. Reimbursement is extremely important and it goes down 10% every year. Terrible! Very often insurance does not cover the extra cost for the best implant possible for a patient. For example, a customizable implant is more expensive than a standard off-the-shelf implant. They are more expensive because of additional imaging and because products are made in a more expensive way. I do not think that Conformis' implant or technique is so different from anyone else. Hip and knee replacements are more on the commodity side. Nobody has a really radical new idea of knee treatment or how to design your implants. There are technical differences on implantation technique, of course. Most important is that the knee implant has been out there for many years and there are good clinical data to rely on. Every manufacturer has tuned up its products to serve well. Conformis has replacement products for the knee and the hip. The upcoming full launch of the Conformis Hip System. New knee replacement product lines (cement-less knee). Cost savings initiatives, including moving some manufacturing offshore, which increased gross margin. Slight increase in US revenue. We read reports from BTIG and SunTrust earlier this year, and they also mentioned these points. We don't believe any of them fundamentally justify CFMS recent rally. 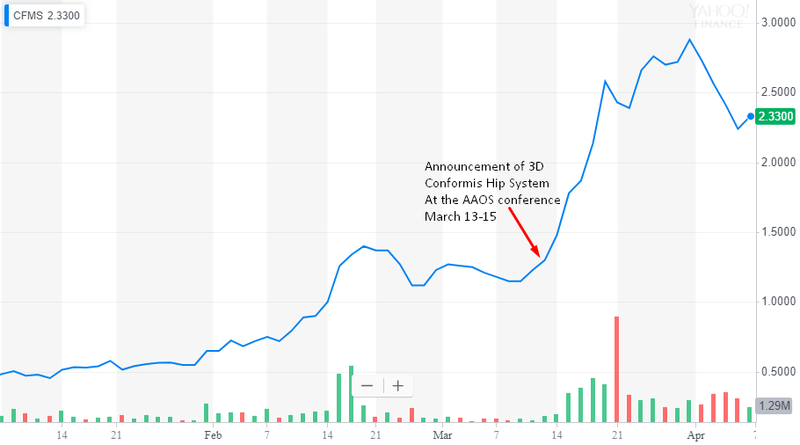 In the chart above, we point to the day on the chart, March 13, when the company released a PR announcing the presentation of its 3D designed Conformis Hip System at the AAOS conference from March 13-15th. On March 12, CFMS stock price closed at only $1.23. The stock proceeded to close higher the next six days in a row to close at $2.58 on 3/20/19. The stock went even higher over the next week before starting to fade. An Exhibits presentation supported by the company, given by a paid consultant, is purely promotional in its nature and talks about the product to anyone who comes to the booth in search of free food and entertainment. That is the least scientific/educational type of presentation at any conference. Peers did not review its content, there is no objective moderation, and the audience typically includes listening competitors. If Conformis had any new real clinical data, we believe it would've been presented at one of the main Oral or Poster sessions of AAOS. 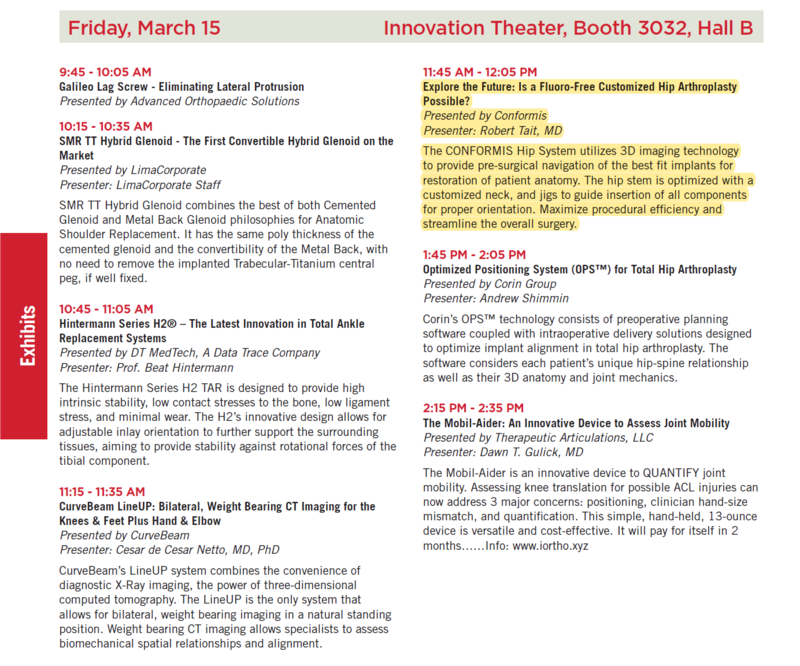 But we found nothing in the main AAOS agenda related to Conformis' hip product. The company does not have any solid clinical data regarding its hip product, which has been confirmed by CFMS management in the most recent earnings call. Thank you. Hi, guys. Mark, you just mentioned some initial feedback you've gotten on the hip. I was wondering if you could share some of the comments you've heard from surgeons with regard to the procedure itself and patient outcomes. Yeah. So it's a little early on patient outcomes, right, because we've got a limited amount of follow-up. But nothing -- certainly, the good news is nothing bad there. I would say that our guys are really working well, especially on the femoral side. We've gotten good report cards on the acetabulum side, but also gotten some really good feedback and opportunities to make even further improvements there. We got some initial feedback about some things around instrumentation on the reusable side that there were some small fixes that need to be done, and so we're incorporating those. So it's like anything else. So the option is going to be spread over, and there's things we have to do, and this is just the first stem version that we have. As you know, we'll have to do other stems or at least one other stem. In the conversation above, it seems the Conformis Hip System still doesn't have all of the kinks worked out yet. It's still a work in progress, and this suggests there will be a slow start in sales after it's fully launched. Surgeon interest in CFMS' new hip system was high around the booth at last month's AAOS meeting. We've seen this movie scene before. Just because surgeons appear to show an interest in a product at a presentation doesn't mean they think it is effective or have any interest in using it in their practice. For example, we have been bearish on surgical robot developer TransEnterix and their surgical robot the Senhance System. Stifel analyst Rick Wise stated in October 2017 that he spoke with many surgeons at the 2017 American College of Surgeons ("ACS") conference and "surgeon interest in Senhance is clearly high." To this day, Senhance sales have continued to be miniscule, and TRXC is trading at lows. SunTrust released a CFMS report update on 3/13/19, discussing attending the AAOS and meeting with CFMS management. The report highlights the Conformis Hip System and Conformis' new knee offering, the G3 Identity. This was a bullish report with a "Buy" rating with a $2.00 price target. However, that $2 target was reiterated from its previous report. Therefore, the analyst didn't see any truly exciting new info from AAOS, or he would've raised his price target. How are your two hip implants feeling? We are researching a company called Conformis that developed customizable hip implants. If you had a chance to get a customizable hip, instead of the standard, off-the-shelf hip implant, would you be interested in it? I'm not sure what "customizable" implants means? They (standard implants) all are customized for every patient i.e stem length, head of femur and acetabular size (for hip). Sometimes that has to be done at the time of surgery to make sure lengths are even. In the case of my hips they are made by a company called Stryker. Mine are doing great - I'm even running on a treadmill :) I'll try to look up that company and see if they have any recent studies on their prosthesis (implants). The 3-D technology (from Conformis) is similar to what you see in dentistry for producing crowns that are anatomically correct. This does sound like the future - however, price is an issue right now, as well as time to produce the custom made prosthesis (about 6- 8 weeks from what I've read). This interviewed patient seemed happy with the Stryker hip implants. Although he is intrigued with customizable implants, he also realizes that price is an issue because of decreasing reimbursement, and that custom designed implants take a longer time to surgery. He knew this and he isn't even a doctor, he is a physical therapist. The Conformis Hip has been around for a while. It received 510K clearance on 6/20/17, and had a limited launch in 3Q18. It is scheduled to go full launch in 2H19. New Conformis Hip System sales are immaterial at this time. Conformis' customizable knee and customizable hip are based on similar technology. We expect the customizable hip will have the same drawbacks and problems that Conformis' customizable knee has. Similar to the design process for the Conformis knee technologies, the Conformis Hip System uses proprietary advanced imaging and design software, to design, manufacture and deliver the suite of FDA-cleared patient conforming knee and hip replacement implants and iJigs instruments. After each patient's CT scan is converted into a 3-dimensional computer model, the unique measurements of each patient's anatomy are transformed into a comprehensive, individualized, pre-operative surgical plan that is delivered to the surgeon in advance of the operation. Each component of the Conformis Hip System is pre-navigated to fit the patient, with certain components designed specifically for that patient. The Conformis Hip System is delivered directly to the hospital or surgery center in a single patient-labeled kit, eliminating the need for excess inventory. Patient conforming, single-use, 3D printed cutting guides are also included in the patient-labeled kit, limiting the need for the vast amount of reusable instruments required for a standard off-the-shelf total hip replacement. Lack of clinical studies, additional cost, lack of reimbursement, a rigid business model with a specific implant kit, increased risk of physician error, a longer wait for the surgery, and no economy of scale. It seems to us that adding another customizable product with an unknown value proposition and poor reimbursement will just increase Conformis' losses. So while the overall market is, I think, you suggested growing at 1%, I think if you look at your data, you'd probably see that - and come to the conclusion that the cement - the cemented CR segment is actually declining. And that's been our biggest in legacy kind of base business, one of our biggest challenges that we have. So that's why the press-fit is so important for us. Cement-less, or press-fit, knees are getting more popular among orthopedic surgeons partially because of wide adoption for hip implants. Most manufacturers offer in their portfolios both cemented and cement-less knee implants. From the Q418 call, we learn that a limited commercial launch of Conformis' press-fit knee is expected in the first half of 2020. Judging from the hip market introduction, it may take Conformis 12 months or longer from a limited commercial launch to commence with full commercialization, meaning that no material revenues from a new cement-less knee will be expected before 2021. How did it happen that Conformis is so late to join the press-fit trend? Is it just a management mistake/oversight or is it something technically difficult to achieve with a customizable knee? We spoke to an engineer with experience in medical device design to figure this out. He explained to us how the press-fit works. Unlike the cemented implant, which has a smooth surface ready for gluing to the bone with cement, the cement-less implant has a porous and rough surface, which is tightly pressed to the bone and tissues are allowed to integrate into the porous metal structure. This is similar to modern dental titanium implants, which require no glue and are integrated into bone structure due to tissue in-growth. Whenever the bone is prepared for the implant during surgery, there is some geometric mismatch between implant and bone, which our expert called "voids". Cement easily fills these small voids. But the quality of the press-fit bond deteriorates quickly with the increasing size of the voids. The expert concluded that premanufactured jigs may limit a surgeon's ability to precisely shave bone to minimize these voids, thus making press-fit harder to achieve for a customizable jig set. This report, published several years ago, also talks about similar technical issues with customizable knee implants. Conformis is cutting costs to increase its gross margin. As we pointed out earlier, knee customization isn't covered by additional reimbursement in most cases; therefore, coverage is similar to the off-the-shelf implant. This makes Conformis less profitable versus its competition. In 2018, gross margin improved 1,100 basis points to 48%. It was actually higher, but we are discounting a one-time payment of $10.5M royalty settlement that Conformis received from Smith & Nephew. 2017 gross margin was 37%. While we understand the desire of Conformis to improve gross margin, the important question is how much fat can the company trim before starting to stress its business. Unlike the off-the-shelf implant, customized products of Conformis require additional imaging scans, translation of these scans into CAD drawings for the manufacturing of the customizable implant, manufacturing the unique implant, making a unique set of jigs, and delivering at a predetermined date to the hospital. As the company cuts costs and corners, the probability of errors, delays, and non-conformities will grow. Savings on margin therefore may hit hard on Conformis' top line. If it is a customizable implant, the surgeon is not sure how the surgery will go and he needs to have another (standard) implant available, just in case something goes wrong. We call it "backing up", it's a safety thing. With a standard implant, surgery can be done within a few days because the surgeon already has the implant on the shelf. With a customizable implant, surgery needs to be planned a month in advance. With all those extra steps, what if one step doesn't work well? What if the implant doesn't arrive on time or there are errors? Then, the physician goes to plan B and uses an off-the-shelf implant. If that happens, it's likely the physician wouldn't work with Conformis again. This is a high risk for CFMS top line. Conformis is outsourcing the CAD (Computer-Aided Drafting) work to India. In the past, they said they will make the CAD fully automatic. "Fully Automatic" did not happen, and outsourcing to India is not a good option, in our opinion. It may save money in the short run, but in the long run, it increases risk compared to doing the work in house. There are several issues with outsourcing work to India. First, it's much less transparent. You get a much better quality control system when working with a local engineer from the US. Second, it requires investment in the education of Indian workers. When up and running, the Indian partner company may raise their fees, realizing the critical nature of business continuity for Conformis. Third, there's also the risk that the CAD drawing won't be done on time, because of communication issues and logistic delays, given such remote locations. In 2018, Conformis' US revenue grew 6% y/y and Q418 revenue grew 10% q/q. This was faster than the overall market growth of knee implants, which is 1% annually, as stated in Conformis Q418 earnings call. This growth, however, was due to an aggressive push into US marketing and sales, rather than a sign of orthopedic markets warming up to Conformis' products. The increase in US revenues is only a part of the story. Comformis grew its US sales force by a whopping 14% in 2018, while reducing outside US (OUS) marketing and sales. Conformis also reported a significant decrease in its OUS revenue, which 85% of OUS revenue is in Germany. With the OUS revenue decrease, the overall 2018 revenue increase was only 2%. I'm pleased to report we grew our feet on the street, if you will, in '18 by about 14%, and we're finalizing targets. But we're going to be, hopefully, at a minimum 10% or more for 2019. We see that Conformis raised its 2018 US sales force by 14% and that resulted in only 6% annual growth. Conformis CFO Paul Weiner said in the Q418 earnings call that he expects revenue growth in the US to be only 4% in 2019. Again, revenue growth is projected to be less than the percentage increase in the sales force. Conformis' aggressive selling of its unprofitable product could speed up the cash burn of its small cash balance. "We're looking to decrease our loss of business in Germany to some degree, but also we're expanding into other countries. So that should help offset the weakness we're seeing in Germany. So we expect to see improvement in both the US as well as the OUS." We don't look at new country rollouts as a positive development for CFMS. In fact, if Conformis is going to use its precious resources to try and create a market in other countries, we think that's a negative. If a company doesn't sell well in Germany, there aren't too many other options in the EU. France and the UK don't have good reimbursement, and the other EU countries don't have the funding to spend on a novel, unproven, expensive product like customizable knee implants. If Conformis doesn't sell well in the US, which usually pays top money for medical devices and drugs, then it won't sell well in Europe. It wouldn't sell well in China or Brazil either, where reimbursements are inferior to the US. We believe new country rollouts is a fruitless effort until Conformis can have new clinical studies that prove its customizable products are superior to the standard. Why Is Conformis A Failed Market Experiment? What Is Wrong With This Company? In 2002, at the time of the filing if its original patents, the Conformis idea was novel and interesting: to create a customizable implant with a better fit to the patient anatomy. A better implant fit should have reduced post-surgery complications and increased patient satisfaction. Conformis also came up with the customizable sets of disposable jigs to save surgery time by standardizing the implant procedure. Disposable jigs were designed to eliminate the necessity of using multiple reusable surgery tools, thus reducing the number of surgical steps and lowering the facility re-sterilization burden. It was assumed that payers would provide a higher reimbursement for the Conformis implant realizing the potential cost savings on the lower re-operation rate. Unfortunately, things did not work out that way. Instead, the Conformis market experiment revealed multiple barriers and challenges. Clinical studies have failed to prove customizable implant clinical benefits. Lack of established clinical benefits result in denial of extra reimbursement required for the customizable implant. A rigid business model leaves no room for error. Any deviation from the plan can result in a lost sale, impacting the firm's reputation and increases cost of goods sold. Customizable implants have increased risk of physician error because physicians are much less familiar with the customizable products they seldom use. Compare it to an off-the-shelf (standard) implant which physicians place hundreds or thousands of times. Nobody likes the need for several extra CT or MRI scans required for customization of the knee implant. It calls for extra time and expense, which is rarely reimbursed, complicates scheduling, and causes delays. In an effort to standardize implantation procedure, Conformis limits the physician's surgical choices. Good surgeons are constantly improving their implantation technique, and they pride themselves on their surgical skills. Some surgeons, therefore, may feel limited with standard kits provided by Conformis. Conformis is a small company, and its support for future implant revisions is not guaranteed. Conformis' premium product price is at odds with public pressure on hospitals and physicians to reduce knee surgery charges. Conformis' model does not fit popular technology trends in knee implants, namely robotic surgery, surgical navigation, and press-fit (cementless) implants. Without economy of scale, Conformis is forced to compete with much larger firms on price. Other companies came up with similar customizable products. We believe for Conformis to ever make an impact in the knee or hip replacement industry, it will need to conduct clinical studies that prove that its product is superior to the standard. We have not seen any indication that Conformis is going to do any significant clinical studies, likely because of the lack of cash required to run such studies. Besides, the results of such study might not be what the company or shareholders want to see. The saying "it's better to remain silent and be thought a fool than to speak and remove all doubt" may well apply to Conformis. 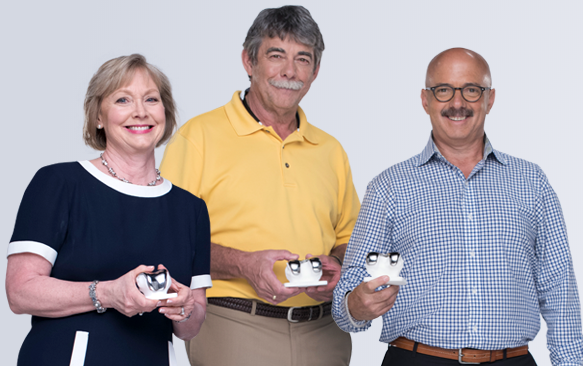 To date, we have collected only limited clinical data regarding our iTotal PS knee replacement product, and no clinical data on our Conformis Hip System replacement product, which is currently in limited commercial launch. We are aware of three such clinical studies. First published in the Journal of Arthroplasty in 2016, conducted by a single surgeon and involving only 21 iTotal CR patients, in which our iTotal CR product performed less well than off-the-shelf knee replacement products. The second such study was published in Kansas Journal of Medicine in 2016 and investigated MUA (Manipulation Under Anesthesia is generally indicated for patients who do not achieve greater than 90 degrees of flexibility by 6-12 weeks post surgery, considered a significant post-surgical complication) rates in 21 patients with the iTotal CR and 57 patients with an off-the-shelf PS implant performed by a single surgeon. The measures on which our iTotal CR product performed less well than the off-the-shelf products were range of motion at six weeks and MUA rates. The third such study was published in the Journal of Arthroplasty 2018 and conducted by a single surgeon involving 115 of our iUni implants. Patients in this study experienced a higher than typical revision rate than is typically noted in literature when reviewing comparable implants. Plain as day, in Conformis' own 10-K filing, they say that its knee replacement product performed less well or not better than the standard knee implants in the above three studies. Some more studies were mentioned in the 10-K that showed Conformis' knee implants were on par or better than the standard knee implants. However, all of those mentioned studies were uncontrolled, not randomized and directly supported by Conformis, so they present weak scientific evidence. We believe Conformis products are sold at premium prices (five percent higher ASP on average as stated on page 18 of the 2018 annual report) but don't give any additional benefits to the patient. That is a big reason why sales remain miniscule compared to its larger competing companies like Stryker, Smith & Nephew (NYSE:SNN), Zimmer, and DePuy. It's similar to if your car was totaled and you received a $20K payout from your insurance company. On a new car lot, you find five standard cars priced at $20K and one customized car priced at $21K. You think customization does not provide enough value to pay the extra $1K out of your pocket, so you ask the insurance to increase its payout to $21K, which your insurance declines to do. Plus, a car dealer has much more confidence in the reliability of a standard car over the customized car. We are aware of certain private insurers that at this time are not agreeing to reimburse for our products as they consider the use of custom implants or patient-specific instrumentation for knee replacement surgery as investigational, unproven or experimental or not medically necessary. …. In addition, the American Academy of Orthopedic Surgeons currently has published clinical guidelines that do not support the widespread use of patient-specific instrumentation in total knee arthroplasty generally, at least until additional data regarding any purported advantages can be considered. (In 2019) we continue to experience MDK denials of the higher reimbursement code, which continues to adversely impact our sales in Germany…. It appears that insurance covers customizable implants at the same rate as off-the-shelf (standard) implants. Because customizable implants are inherently more expensive to manufacture, the ASP, according to Conformis, is on average 5% higher than that of the off-the-shelf implant (as shown on page 18 of the 2018 annual report). The hospital, therefore, would have to pay the difference in price from its own pocket, which few do. If hospitals won't pay it, then Conformis will have to give discounts and/or patients will also have to pay extra, which they do pay for the CT and MRI imaging required. It is clear to us that the two pictures above were placed to elicit a positive emotional response and market to the prospective patient, not the physician. There are many pictures on the website with patients having big smiles and holding up their implants. However, reading a chatroom on patient.info, the reviews from Conformis patients are very negative. Most mention how much pain the patients are in. It's a much different perspective than the pictures of happy patients on the Conformis website. The above story is heartbreaking for that woman. It illustrates the importance of getting more than one expert opinion before undergoing a surgery that will have such a huge impact on the rest of your life. You can often find patients complaining online about a surgical procedure going bad. But the complaints do seem especially tragic with Conformis online reviews. We won't post any more here as you can read them on the chatroom link we provided. Conformis' business model is too rigid. With a customizable implant, disposable customizable jigs and "just in time" delivery of the implant leaves limited room for product and logistic error. If anything goes south, surgeon either has to reschedule surgery or to use off-the-shelf implant. CFMS does not manufacture standard off-the-shelf product. This makes CFMS business model to be extremely sensitive to business continuity. Any deviation from "as planned" is amplified in a lost sale, impacted firm reputation and an increased cost of goods sold. If it is customizable implant, the surgeon is not sure how the surgery will go and he needs to have another (standard) implant available, just in case something goes wrong. We call it "backing up", it is a safety thing. 4. Customizable implants have increased risk of physician error because physicians are much less familiar with the customizable products they seldom use. Compare it to an off-the-shelf (standard) implant which physicians place hundreds or thousands of times. Even if our iJigs and implants are manufactured exactly to specification, there is a risk that the surgeon makes a mistake during a procedure, leading to patient dissatisfaction with the procedure. Furthermore, based on their prior experience using non-customized, off-the-shelf implant products, surgeons may be accustomed to making modifications to the implant components during a procedure. We very rarely use customizable implants. If it is a mainstream implant, then the surgeon knows all intricacies of its placement, because he performs many similar procedures. If it is a customizable implant for a specific patient, the surgeon is not as familiar. 5. Nobody likes the need for several extra CT or MRI scans required for customization of the knee implant. It requires extra time and expense, which is seldom reimbursed, complicates scheduling, and causes delays. It (Conformis Total Knee) is an Ok product, but nobody uses these products. There are several reasons. The main one is the imaging before the surgery; it is seldom paid for by an insurer. 6. In an effort to standardize implantation procedure, Conformis limits the physician's surgical choices. Good surgeons are constantly improving their implantation technique and they pride themselves on their surgical skills. Some surgeons, therefore, may feel limited with standard kits provided by Conformis. Because our products are already individually-made to fit the unique anatomy of each patient, modifications made to the implant components or the process of fitting the implant during the surgical procedure are not recommended and may result in negative surgical outcomes. 7. Conformis is a small company, and its support for future implant revisions is not guaranteed. If a younger patient needs to have a revision in, say, 10-15 years, the customizable knee from a small manufacturer is the worst thing possible. Patient will unlikely get to the same surgeon and the medical records about the exact type of customizable implant may not be available. Nobody knows exactly what it is, how was it made, how was it implanted and secured in the bone. It is like, what if I do not have a correct tool to remove a specific pin from the bone? So, you open the knee and then you need to improvise to remove it with minimum bone damage. Every time we a put knee in, we like to cut the least amount of bone, every time we pull the knee out for a revision, we also like to remove the least amount of bone. With a smaller manufacturer it is always a risk if the patient needs to go through knee revision or replacement 20 years from now. Is this company still around? Will they support a revision case. A larger vendor, which is still around ( at the time of revision surgery) can perhaps offer a replacement product to fit the overall product platform. Or a surgeon doing knee implant revision can replace only a part of implant, not the whole implant. 8. Conformis' premium product price is at odds with public pressure on hospitals and physicians to reduce knee surgery charges. As stated in this article from 8/27/18, the price for knee-replacement surgery has increased every year. One hospital, of the Gundersen Health System, found that one of its hospitals has an average price of $50K for the procedure, including the surgeon and anesthesiologist. However, the actual cost for the hospital was only $10,550 at most. Articles like this one lead to public outcry and new healthcare policies reducing surgery reimbursement. 9. Conformis' model does not fit popular technology trends in knee implants, namely robotic surgery, surgical navigation, and press-fit (cementless) implants. Robotics are huge for knees. There is out there Mako from Stryker, Navio from Smith and Nephew. Many surgeons like it, though we still do not have the full picture on the outcomes. It is a new surgeon mentality to use robots. Navigation is relatively new and it is a great intra-operative tool. You may do navigation with or without a robot. Navigation slows things down, which may increase risk of infection. While CFMS views its system as primarily an alternative to robotic assisted arthroplasty that yields equivalent results in a cost effective manner (especially important in the emerging ASC environment), the company also acknowledges that their custom implants could be used in conjunction with a robot thereby minimizing surgical variability and perhaps helping with soft tissue tuning. As stated above, while not shutting out the possibility of using the custom implants in conjunction with a robot, Conformis still primarily views its system as an alternative to robotic assisted arthroplasty. That is going against the momentum of robotic-assisted surgery adoption by surgeons. 10. Without economy of scale, Conformis is forced to compete with much larger firms on price. This is a tough market space, Conformis is against giants such as Stryker, Zimmer, Smith &Nephew, DePuy. A lot of the knee business is a contract business with the hospital. It is hard for a smaller company to come and to take business from a bigger vendor, from a massive company. 11. Other companies came up with similar customizable products. Customizable knees have been available for many years. The Conformis knee is one example, but other companies have their own customizable knees. For example, Zimmer has PSI customizable knee. "We do have a couple other vehicles already in place whether it be the ATM or the deal that we recently did with Lincoln Park Capital where we can either sell stock either to the market or to Lincoln Park Capital." The earnings call was done on 2/6/19, CFMS closed that day at $0.72. Today, at a valuation of over $2 with no news since the earnings call, we would assume that the company will utilize its ATM at the current price before the risk that the stock falls back down to below $1. As shown in the 2018 10-K, Conformis isn't shy about using its ATM. Via its ATM, it sold 228,946 shares in 2017, and 556,334 shares in 2018. LPC has a history of being a lender of last resort in penny stocks that no one else will invest in. These articles here and here show LPC's history of speculative investments that went bad for shareholders. …maybe you can talk about what the culture is like at CFMS now following the restructuring in terms of reps and stability and turnover and how that's trending going forward? "As far as the culture, yeah, look, it's always tough to make changes like this because, I guess, there's a lot of good people…. ….I'm not going to minimize that change is tough, but I feel like people kind of really rallied around kind of what we're doing, and frankly, have been very understanding. …. so I think that part is good….."
It looks like CEO believes that morale is great at CFMS. We got very different perspective from the employee 2019 comments on glass door. Here are 5 employee reviews, which all gave 1 out of 5 for "culture and values" at CFMS. We think the long term valuation for CFMS is zero. In our opinion, under current reimbursement conditions, and with the vague clinical benefits of customizable knee and hip implants, Conformis is a money losing proposition. Conformis was an interesting market experiment which did not pan out. 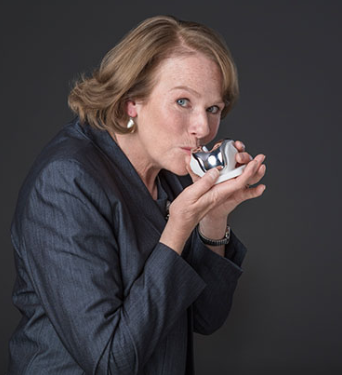 The business has been around for more than ten years, and it is not new anymore. As we showed in this report, the value proposition of customizable orthopedic implants are not truly aligned with the interests of physicians, hospitals and payers. The value proposition for patients has not been proven in clinical studies. Modest cannibalization of higher margin legacy products. To us, this is an unrealistic scenario. Let's say Stryker buys Conformis. To fulfill analyst expectation and to justify the $2 per share acquisition, Stryker has to more than triple the sales of Conformis product in 5 years, increase Conformis ASP by 5%, sell it to new customers to avoid significant cannibalization of its more profitable Stryker products, while increasing gross margin by 1000 basis points. At the end of 2018, CFMS was trading at $0.40 per share. No competitor was eager to acquire CFMS at that low price. Why would they acquire it now at $2? Conformis has been losing money every year since its foundation of more than 10 years ago. There is no date in the future or a reasonable execution plan when this bleeding will stop. With steady decreasing reimbursement for knee implants, expiring foundational Conformis patents, lack of forthcoming significant clinical data and empty coffers, Conformis future is simply doomed. Disclosure: I am/we are short CFMS. I wrote this article myself, and it expresses my own opinions. I am not receiving compensation for it (other than from Seeking Alpha). I have no business relationship with any company whose stock is mentioned in this article.